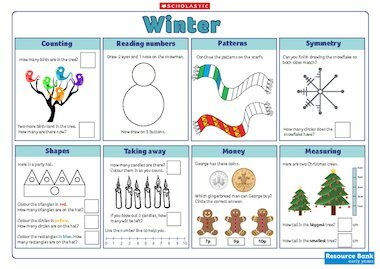 Use this Early Years Winter Seasonal Maths Activity Mat to practise a variety of maths skills from basic counting, reading numbers, adding, subtracting and doubling numbers, using number lines, and working out number problems, through to comparing sizes and measuring, recognising shapes, creating patterns and symmetry, and handling money. This Seasonal Maths Activity Mat is also perfect for more able children who need a challenge. Let them work independently and show individual understanding of different concepts.